The jungles of Asia form the backdrop to Tiger Rush, the beautiful looking video slot from Thunderkick. This one is played using a 5 reel, 10 payline game engine. Trigger the bonus round and you’ll get free spins on a 25 payline reel set. Look out too for tiger wilds that fill whole reels as well as awarding re-spins. Play on your PC, tablet or mobile from 10p and £100 per spin. Innovative design is a feature of Thunderkick’s range of video slots and they’ve produced another cracking looking game here. With a lush green jungle in the background, you’ll see ornately designed stones spinning around the reels. They’re joined by a pair of etchings that show a wild scene. The top paying symbol awards 15 times your total bet if you land 5 across a payline. It’s all rather lovely. Joining the standard symbols is a beautifully drawn tiger which is the wild. This can land on the middle 3 reels only. When it does hit, it expands and fills the whole of the reel (i.e. to give you a wild reel). You’ll also be awarded a re-spin whenever a wild hits. The other extra on offer in Tiger Rush is the Bonus Game feature which can be triggered in 2 ways. Either land the neon Tiger Rush logo scatter on reels 1 and 5 on the same spin or land the wild on a position directly adjacent to the tiger wild. You’ll then be awarded 5 free spins for either method – if you do them both, you’ll begin with 10 free spins. Landing 2 scatters or the wild/scatter combination adds another 5/10 free spins to your total. The expanding wilds are in play during the feature too. You won’t find many video slots that are easier on the eye than Tiger Rush which looks terrific. The gameplay is simple enough but there’s enough going on to keep things interesting. 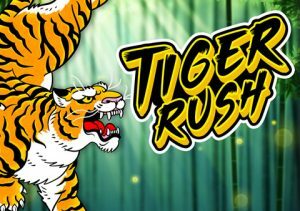 It’s not as eccentric as some Thunderkick titles but the combination of high-end design and simple features make Tiger Rush a playable game. You can also win 1,783 times your bet on every spin/free spin! If you want something different, Thunderkick offers you this – they have many great games like Pink Elephants and Luchadora.